Posted by admin on Jan 30th, 2019 and filed under News. You can follow any responses to this entry through the RSS 2.0. Both comments and pings are currently closed. The visit of President Mohammadu Buhari to Imo State for the Presidential Rally of the All Progressives Congress APC, which took place at Dan Anyiam Stadium Owerri on Tuesday has rather brought jubilation in the fold of Action Alliance AA members, than APC camp. Reason? President Buhari’s statement that Imo electorate of APC extraction in the spirit of free and fair election in 2019, should vote for candidates of their choice has thrown celebration into the camp of Action Alliance AA and its Imo Governorship candidate Chief Uche Nwosu, who believes the President’s statement is a tacit approval that APC members are free to vote for AA during the forth-coming Governorship election in Imo State. Already, AA in Imo State has adopted President Buhari as its Presidential candidate for the election. Many who thronged the Dan Anyiam Stadium for the epic event had waited to hear the President give a categorical statement on the lingering matter between the AA and APC over the issue of Imo Governorship by giving instruction that APC members should vote for Senator Hope Uzodinma, the APC Governorship candidate in the State and ignore AA. However, rather than urge APC members to queue behind Imo APC Governorship candidate Senator Hope Uzodinma during the Governorship election, the situation was not so, as the President left the matter for Imo electorate to decide their choice. This scenario, according to political pundits is an indication that the 2019 Imo Governorship election, as regards APC and AA is now thrown open for Uche Nwosu and Hope Uzodinma, to be determined by Imo electorate. This situation has brought celebration into the fold of AA, and its Governorship candidate, Chief Uche Nwosu, who took a couple of pictures with President Buhari at Ikemba Ojukwu Square, Owerri, even before the Governorship candidate of APC, Senator Hope Uzodinma could have a glimpse of the August visitor to Imo State. 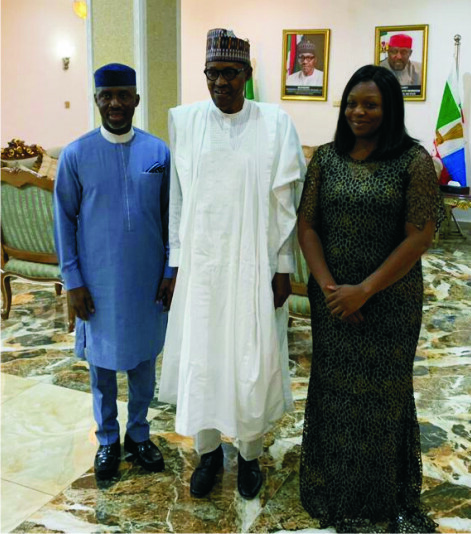 Many had wondered what may have transpired between Uche Nwosu and Buhari on Tuesday within the time his father-inlaw, and Governor of Imo State, Owelle Rochas Okorocha hosted him, where the AA Governorship candidate had pictures and intimate discussions with President Buhari in company of his wife, Uloma. For Political pundits, it was as if Buhari had two Rallies in Imo on Tuesday, One at Heroes Square for AA members, and the other at Dan Anyiam Stadium for APC people. The President’s visit to Imo rather than dampen Imo AA, has instead emboldened the members more, with their latest adoption of Buhari as their Presidential candidate. Meanwhile, while Okorocha holds the APC Senatorial ticket for Orlu zone, his son inlaw and Governorship candidate of AA, Uche Nwosu is Okorocha’s chosen one and prodigee. Despite pressures from all quarters, Okorocha has stuck with Uche Nwosu as the fellow he wishes to succeed him in office. Within Imo APC, a majority of the candidates are of Okorocha’s political family, and still works for the Governor’s political desires, even from APC, which shows that Imo APC members still work for AA from inside. In Orlu, Okorocha controls a large section of voters in that zone, while Emma Ojinere of “Rochas APC” has the APC ticket of Owerri zone Senate. There is also Hon Nnanna Igbokwe for Ezinihittee/Ahiazu Federal Constituency in APC. In Okigwe zone, the AA Deputy Governorship candidate, and Speaker of Imo House of Assembly, Rt Hon Acho Ihim holds sway with the AA gospel. Also in Okigwe, there is Hon Chike Okafor, who flies the flag of APC for Ehime Mbano/Obowo/Ihitte Uboma Federal Constituency. All these men and their followers are for AA in soul, but APC in Body even though the hold the party’s ticket. The Uche Nwosu Governorship flag-off at Dan Anyiam Stadium some days ago shocked many who had thought that the young man has not such mammoth followers. With the latest outing by Buhari which many had thought would have given final burial to the Uche Nwosu Governorship matter, with a stern warning to the youthful politician to stay away from APC, the tide has really turned in favour of Nwosu whose camp is in jubilation mood now. Their celebration stems from the present situation as it means that APC members can work for Uche Nwosu’s Governorship, which pleases the camp because a lot of APC members will vote for AA despite their present positions in Imo APC now. Meanwhile from all indications, President Buhari is playing safe and only after votes he will get from Imo during his election. Therefore he knows he will get votes from APC and even more from AA, with Okorocha still the incumbent Governor and his son inlaw Uche Nwosu as the candidate of AA in Imo. In this case Buhari has left supporters of APC and AA to by themselves decide between Hope Uzodinma and Uche Nwosu, whom they want to vote for.